The first two CureRock-a-touille dinners were great successes. We have another event planned for 2016 (all good ratatouille dishes need multiple layers, right?). The next event will be held in February 2016. Keep checking CureRock.org and @CureRockPGH on Twitter for news and updates! Special thanks to Pittsburgh artist Krystal Duke for the great poster! I am a childhood cancer survivor. I’ve gotten so used to saying that, accepting that as part of my identity, that I sometimes forget the weight of those words. In the spring of first grade, 1999, I failed the school vision screening. That summer, I became a cancer patient at Children’s Hospital of Pittsburgh of UPMC when an MRI detected a tumor at the base of my brain. But in January of 2001, my family got a call from CHP. My most recent follow-up MRI showed new growth. The cancer was back for round two. That spring, I received six weeks of daily radiation treatments pinpointed at the tumor. Thankfully, this put me into a second remission where I have remained for the past 12 years, and will hopefully remain for years to come. No child should have to call brain biopsies, Medi-Ports, IVs, numbing cream, finger sticks, growth hormone shots, blood transfusions, face masks, hairbrushes full of hair, MRIs, foul-tasting laxatives, excruciating leg cramps, crippling fatigue, nights awake puking in the bathroom, school days spent in the nurse’s office, sleepovers sent home early, dance classes missed, and friends lost, their childhood. No child should be so familiar with a hospital that they can find their way to the chemo clinic, the OR, or the radiology suite with their eyes closed. No child should be able to hum along with the MRI machine or an IV pump. No child should have these memories a part of their childhood. Because I can call all of this part of my childhood, I have chosen to spend my life giving back to the hospital that has made it all more bearable and has given me life so that I may reflect on childhood at all! While there is so much pain and hurt in my past, thanks to CHP, there is also so much happiness-past, present, and future. Some of my best childhood memories are of Camp Courage, a CHP sleep-away summer camp for oncology patients. Thanks to the Adolescent and Young Adult (AYA) Oncology program, I’ve had some once-in-a-lifetime experiences with irreplaceable friends. And now, as a Staff Nurse at Children’s, I have the privilege of working with children and their families on a daily basis. Until there is no cancer in the world, kids and their families should have a program and a place like the Oncology program at Children’s Hospital of Pittsburgh of UPMC. This is why I CureROCK. The following article is reposted with permission from Be Glad You Have Children's. I was 18 years old when I was diagnosed with Hodgkin’s lymphoma. To say the least, April 28, 2011, wasn’t exactly what most people would call normal. Immediately after the diagnosis that day, surgery was done on my neck to remove a tumor and on my hips to check the bone marrow. I couldn’t walk or turn my head properly for days. 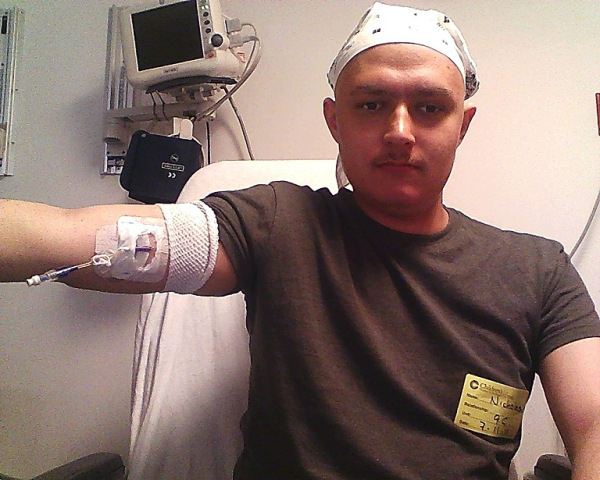 Soon after, I got my PICC line implant; to those not well-versed in medicine, it is effectively a long-term IV. My summer that year consisted primarily of staying indoors as I got chemotherapy infusion treatments on the ninth floor of Children’s Hospital of Pittsburgh of UPMC or hid from the sun due to the chemo’s side effects. On a lighter note, I occupied my time by writing music and attempting to master guitar or entertaining myself with video games and “Star Trek”; that is, whenever I wasn’t feeling like a sack of potatoes from the chemo. And don’t forget the part where my brother had to shave my head. After stopping in one day for chemotherapy, I proceeded to take off my headphones so that I could speak to my doctor when she came into the room. Except my headphones didn’t want to let go of my hair. Also, my hair was perfectly fine and dandy with the idea of letting go of my scalp. Within moments, a lonely long lock of hair dangled from my headphones. From the copious amount of hair on my head in my picture, you can probably tell that I was … less than pleased with this turn of events. Though, as unpleasant as the cancer experience is, it actually went pretty well thanks to the oncology team at Children’s Hospital. Somehow, sitting in the infusion room with the medicine going through my PICC line was fun. 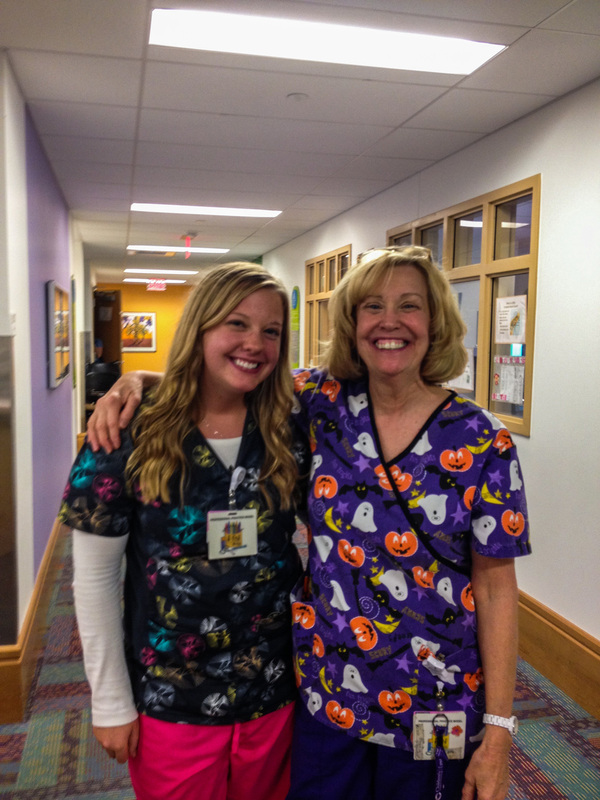 The nurses, Patty, Mary-Ellen, Aimee, and Staci, just to name a few, were very supportive and simply great company any time they were around. Moving from chemotherapy to radiation therapy wasn’t any different. I was welcomed with open arms by Dr. Melvin Deutsch and the technicians. The weight on my shoulders diminished. A few months went by with the start of my first year of college at Penn State and entering remission when I get a piece of mail. I expected it to be related to my treatment, but instead I got an invite to a ski trip: my first Adolescent and Young Adult (AYA) Oncology Program event. I probably am not alone as far as my stance was when one finds out about the AYA Oncology Program; I was rather tentative at first. Up to this point, I had been a lone wolf; of course I had support from my friends and family, but none of them could actually empathize with my experience. I had a preconceived idea that I, as anyone else who went on the ski trip, would simply meet a bunch of random patients who I would proceed to forget within a few hours of going back home. My plan was to learn how to ski, then hole myself up in the hotel room and be a curmudgeon. Instead, I made a new family. I met people, such as past writer on this blog, Merel Duursma, who after only a couple days, I felt more akin to and have forged better relationships with than some people I’d known for years. And the relationship shows, especially with my birthday landing on or close to the dates of the ski trip. Well, I think it would be easier to just say that it is impossible to feel anything except really awesome when these people throw a surprise birthday party for you. The birthdays I have shared with the friends I have made through the AYA Oncology Program are some of the best I have ever had, if not the best. After this, all I wanted to be was involved. All aboard the AYA Oncology Program train! The network that the program provides is an excellent way to unite patients, and I have met up with some from the program outside of any scheduled events. Often with the focus on chemotherapeutic medical treatment for cancer patients, mental and emotional factors can be overlooked. This program is an excellent support structure that fills this gap with a network of people who can understand each other. But the train doesn’t stop at the ski trip. Next stop: CureRock! The inaugural CureRock event in 2012 at Stage AE featured an assortment of cool, local bands. A fundraiser for the AYA Oncology Program, this annual event is open to all who have the chance to attend, whether they are a patient, friend, family, or just someone looking to rock out. With a long night of music and all the great people from the program events, how can you go wrong!? The next CureRock has been planned for March 29. As a big fan and participant in the rock arena, I’m eager to attend and hopeful to participate in future CureRock events. I’m Nick Ranayhossaini: musician, current nursing student, and full-time survivor. Also I’m a full-time awesome guy. Part-time Batman, but only on Wednesdays (not really). And I am ready to rock!